The single most popular day to fire up your Memphis Wood Fire Grill and get cooking is coming right up. It’s Thanksgiving. Given that it’s the holiday arguably more associated with food than any other, it makes sense that people turn to their Memphis Grills to deliver memorable flavor. While there’s plenty of debate about what is the star of the Thanksgiving table, there is no doubt that a poorly prepared turkey is bound to put a damper on festivities. With that in mind, here are few tips about how to turn that bird into something special. Memphis Grills are not your ordinary outdoor cooking solution. Our Wood Fire Grills are designed to make year-round grilling and smoking a reality. And the versatility of our grills gives you several options when it comes to turkey preparation. 1. Spatchcocking… You Want Me to Do What to the Turkey? Remove the backbone. With the breast side down, use cooking shears (poultry shears) to cut along the sides of the backbone from the tail, up. Pull out the backbone. Open the turkey. Grab the two cut edges and open the turkey. Trim excess fat. Flip the turkey breast up. Crack the breastbone. Put your strong hand slightly to one side of the breastbone. Push down, forcefully, until you hear the bone break. Do the same thing on the other side of the breastbone. Spread the turkey. The turkey can now be laid out flat. Pull the thighs outward and flatten the turkey so the wings point in toward each other and the ends of the legs point outward. You can tuck the wings under the bird for more even cooking. Cook it. The now flattened turkey can now be oiled (for crispness) and roasted. Using the Intelligent Temperature Control Meat Probe, you can cook the bird until it reaches an internal temperature of at least 165 degrees Fahrenheit. It should take roughly 70 minutes. The turkey should be basted at least twice while it cooks. The upside to spatchcocking is speed and consistency in the meat. There are drawbacks, of course. 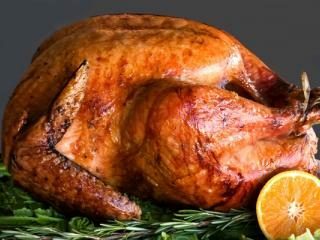 For many, one of the joys of Thanksgiving is presenting a perfectly cooked, beautifully prepared bird. Spatchcocking changes the presentation significantly. For some, the flattened appearance alone is enough to make this method unappealing. Another consideration when it comes to cooking turkey is whether to brine the bird. Brining a turkey involves soaking it in a mixture of water, apple cider, salt, brown sugar and spices for a day before cooking it. This obviously requires preparation and foresight, but some people swear by the results. Another benefit of brining the turkey is that it can be done as part of the thawing process. We’ve debated the relative merits of brining or not brining the turkey in some detail. The short version is that brining definitely adds something, but it is not necessary to produce a delicious Thanksgiving turkey. 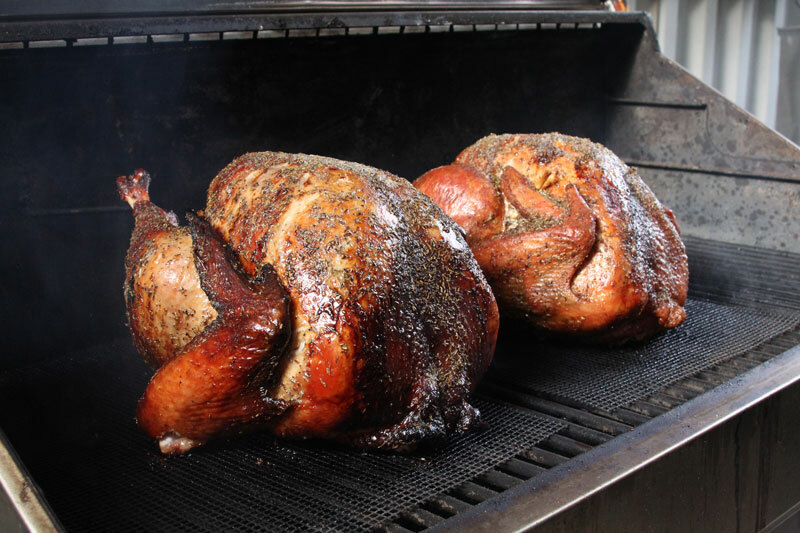 Memphis Wood Fire Grills also offer the ability to first smoke and then roast a turkey. There is some concern about turkey drying out with this method, so in this case we certainly recommend brining the bird first. Prep the turkey as normal, then smoke it at 225 degrees until the internal temperature reaches 110 degrees. Then set your Memphis to 350 degrees and finish cooking it to the recommended internal temperature of 165 degrees. This method of cooking maximizes the smoky flavor that makes wood pellet grilling such a favorite. It does lengthen the process, as a non-spatchcocked turkey can require more than 5 hours to complete. The rub in our Thanksgiving turkey recipe uses salt, pepper, thyme, rosemary, sage and garlic powder. Some recipes would also call for ½ teaspoon of dried marjoram or the use of fresh herbs, including parsley. Most recipes rely on the big three—thyme, rosemary and sage—along with the ubiquitous salt and pepper, to give a Thanksgiving turkey its distinctive flavor. One of the many benefits of using your Memphis, however, is the additional flavor provided by wood smoke. Turkey is not a meat known for its strong flavor. A layer of smokiness can help even turkey deniers see their serving as more than a carrier for gravy and stuffing. Our grilling app allows you to start the grill, adjust, track and control the temperature of the grill, and complete entire turkey-dinner recipes, all with the touch of a button. 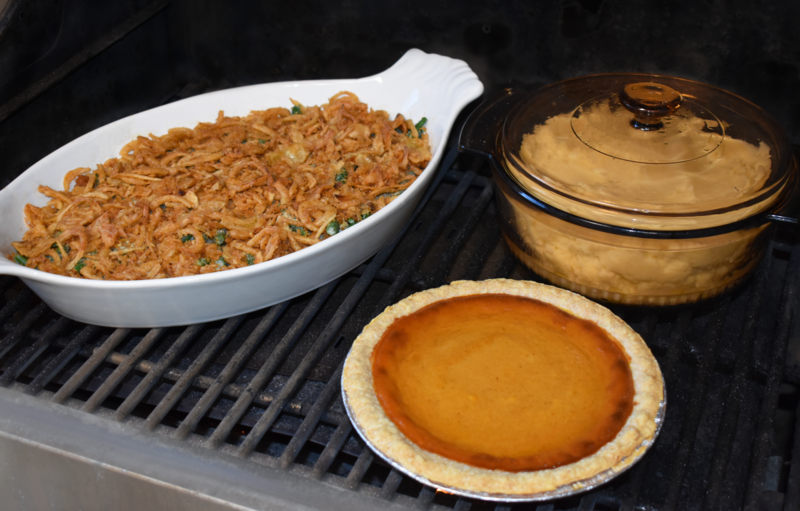 In fact, because our grill app connects your grill to your home Wi-Fi network, you can control your grill even while making a mad dash to the grocery store for the last can of pumpkin pie filling in the tri-state area. However you prepare your turkey, we hope you have a joyous and successful Thanksgiving. And to learn more about our grills, visit a Memphis location near you or contact us today.